Niaz Abdolrahim wanted to be an engineer since she was in high school. She was drawn to the idea of solving problems using math, and of designing new systems and engineering concepts. Later on, her interests evolved from design to research, looking into questions and trying to answer them in terms of theory and applications. 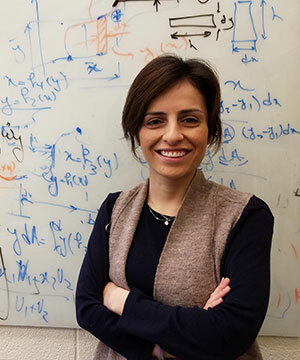 After completing her undergraduate and master’s degrees in Iran, she earned a PhD at Washington State University, where she researched nanoscale materials and their properties. She continued this work at her postdoc at Massachusetts Institute of Technology before arriving at the University of Rochester in 2015. Abdolrahim has continued her research into nanomaterials at Rochester. She seeks to understand how they behave in order to use them for engineering design. Nanomaterials can have a variety of applications: creating energy-saving materials, making batteries, using them in nuclear reactors or in filtration systems, for example. She enjoys conducting research with her students and supporting them as they learn to apply their own individual skills and problem-solving approaches to research questions. Abdolrahim also likes teaching first-year students and discussing basic engineering concepts with them. While she doesn’t necessarily know how to overcome these misperceptions, “the more we talk about them, the more people can realize that there is a difference between male and female scientists, but that doesn’t mean that one is worse than the other. We need to embrace the difference rather than compare.” She reminds women interested in academia that this is their moment. Academic institutions are improving at identifying their need for more women and diversity. Abdolrahim frames working in academia this way: “A tenure-track professorship is kind of like a start-up business.” Professors start up their own labs, grow their research by applying for funding, train a team of staff and students, and so on. In other words, it’s a hard job, one that a person needs to really enjoy doing. According to her, some traits of a successful academic are confidence (or the ability to feign it), assertiveness, and holding your ground. Outside of work, Abdolrahim goes the gym, swims regularly, and spends time outdoors in the summer camping and hiking. She also started learning piano about a year ago for the first time.